Formed in 1993 and based in Fleetwood, Northern Express Glass Ltd is a joint family owned and run business, which has enjoyed continued growth for over 20 years, employing over 130 full time staff, whom have effectively contributed to an annual turnover in excess of £9million. The company was originally based in a former ships chandler’s warehouse on the ports Dock St, but by 1997 increased output and demand for product, enabled the mover to larger premises on nearby Copse Rd. By 2002 productivity levels had reached such a height that relocation for a third time to much larger purpose built premises was necessary. Now utilising over 90,000 sq feet of manufacturing floor space and with a delivery fleet of 20 vehicles. All IGU’s manufactured and supplied by Northern Express Glass are bespoke to the customer’s specific order, depending on the glass type, thickness, size and decorative requirements. Taking the lead from today’s energy conscious society, and as a result of legislation change, sealed units are now produced using glass with highly complex low emissivity coatings. Whichever glass is required, it will be cut on a fully automated Hegla Cutting Station. Once cut the glass is washed to remove any grease marks or finger prints, and the spacer bar complete with primary sealant applied. In years gone by spacer bars will have been made from aluminium or steel, however the demand for more energy efficient units, and advances in technology, warm edge spacers made from more thermally proficient materials have almost become the norm. The glass with the spacer bar are then placed into a press to ensure the primary sealant is completely intact around the perimeter of the unit. The unit is then placed into a chamber containing argon gas, as opposed to dehydrated air, to further improve energy efficiency. Finally the unit is visually inspected and the secondary edge seal applied. Northern Express Glass Ltd is one of the largest independent manufacturers and distributors of insulating glass units (IGU’s) in the UK. Supplying the trade, domestic, commercial and building industry, offering a large range of glazing options, including, Smart Glass, toughened, laminated and decorative designs. There is a growing demand for high specification conservatory roof systems. Glass roofs are far more aesthetically pleasing than the polycarbonate equivalent, easier to keep clean and much better at sound insulation, especially during bad weather. Harmful UV rays are also filtered out, protecting your furnishings from the damaging effects of the sun’s light. More importantly however, a modern glass roof is able to greatly regulate temperature, reflecting back the sun’s unwanted heat and glare in the summer months, yet in winter retaining warmth over twice as efficiently as standard glazing. By maintaining a more consistent temperature as the seasons change your new conservatory becomes an all year round room, making the very most of your investment, for life. In combining all of the elements, SMARTGLASS delivers a natural level of daylight and fresh feel, adding to the character of the room as well as its practical use. With fantastic looks and all of these benefits, its easy to see why glass has become the material of choice for the discerning consumer. 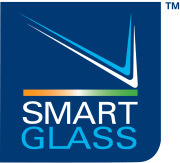 Under continuous development SMARTGLASS features a variety of upgrades to ensure it remains at the very forefront of glass technology, and now with a choice of four colours there’s never been a better time to specify a genuine SMARTGLASS roof to your new conservatory.